So what comes to mind when thinking of progressive metal? Although the word itself generally means “ahead of its time” and is commonly used to describe innovative concepts and ideas, how does this represent in music or more specifically heavy metal? Often when defining the genre structure is always brought up as a defining characteristic with artists testing their playing abilities and if they can keep time in controlled chaos. Although sometimes it’s really impressive to sit back and admire the time musicians have put into crafting really complex songs I generally prefer my progressive metal only being as progressive enough as necessary to convey interesting and innovative ideas. Now opinions differ on who the originators of progressive metal were, Main contenders often mentioned being Fates Warning and Queensrÿche. Though a lesser known group that predates both bands had already been playing unique otherworldly music north of the border for several years. 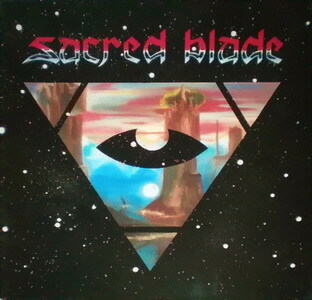 Sacred Blade were formed in 1979 by main visionary/singer/song writer/guitarist Jeff Ulmer and co-founder guitarist Will Rascan. After several demos in 1984 the band began recording for the opus Of the Sun + Moon under contract with Roadrunner Records but due to label problems and only one record label being willing to release the record in a deluxe gatefold LP sleeve (An almost unheard-of thing for any band’s debut release at the time) the record was delayed another two years released in 1986 on French “Black Dragon” label. Conceptionally Ulmer’s vision is a hard one to define, But one free of clichés and with little to no comparisons (Ultimately the goal of any prog musician right?). Quite a bit of thought has obviously been put into every aspect of release starting with packaging and artwork to music and lyrical themes. This album flows exceptionally well and although the individual songs are quite noticeable if you analyse the album it is constructed in such a way that songs connect in an effortless almost conceptional fashion. Even trying to pick standout tracks is hard because it’s like removing crucial compartments to an engine, It’s not going to work without them. I suppose it all comes down to mood, Songs like Salem and Master of the Sun make for great high octane headbangers while Of the Sun and Moon and The Pressing offer a more dream like cruise experience through alien landscapes. Musically Sacred Blade paints a picture akin to Roger Dean’s other-worldly paintings, A very beautiful surreal experience. Most of the non-lyrical tracks on the album work at enforcing the general atmosphere with nice acoustic passages, bells, amazing harmonies and psychedelic solos. With a huge nod going out to Moon where all the musicians seem to set amazingly high standards for instrumentation and song writing in general, What a beautiful way to end a great album. Musically all entities are pretty much on par, superb bass work by James "Zed" Channing always making interesting riffs that shape the songs and never overpower the other instruments. That’s the great thing about this album everything seems so evenly thought out and recorded, It’s all about the bigger picture. Some of the older material like Salem does tend to be slightly more guitar focused with amazing, majestic guitar harmonies and fluent melodic solos by Ulmer and Rascan. Paul Davis’ drum work is also very solid and effortlessly changes time signatures while not giving off that proggy controlled chaos sound that seems overused in progressive metal. But as I said this album is only as progressive as it needs to be to achieve vision. Last but not least Ulmer’s voice, it’s hard of comparisons even to date. On the slow to mid-paced numbers it stays in an almost trance-like mid-range slightly reminiscent of Hawkwind’s David Brock. But with the faster numbers like Salem and Master of the Sun Ulmer bursts into a different style altogether that seemed more inspired by the N.W.O.B.H.M., early proto acts and the up-and-coming U.S. Power metal scene. A shrieky, aggressive, youthful voice that would go nicely on any Epic U.S. power metal album. In any case the guy has a lot of versatility and not just in high and low as the usual metal vocalist but in being able to change elements in the colour of his voice. This album was Black Dragon’s second highest selling item at the time of release, Seems kind of surprising if you take into consideration their self produced re-master of the CD (The only official CD version available) was released in 1999 in quantities of “2000” copies yet is still readily available from that band’s website (How many copies left I am not sure). It’s really sad to see such a visionary outfit fall into obscurity like this when they produced such great music that’s easily available to the public. So let me say this; If you want to listen to a band un-bound by clichés making amazing otherworldly music, Please go to their website and buy a re-mastered copy of this 1986 classic, Or like I did yesterday (Currently only owning their original Black Dragon vinyl) get a discount and buy their second reworked “Othyrworld” album too. Although it’s not my favourite album of all time, I respect it more on several levels for what it has set out to achieve and the legacy it leaves behind. It’s a product of a visionary and has great production and timeless songwriting. This truly is an album from “an othyrworld”.